The longevity and performance of any traffic bearing surface is contingent upon the structural integrity of its foundation. As the sub-base of a roadway design is the portion which actually bears the weight, a sub-base which has not been prepared properly lacks the strength and stability to withstand the effects of continuous traffic loading. 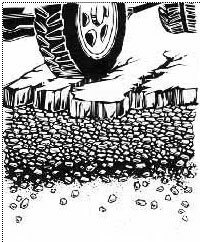 Over time, the supporting foundation weakens, and in-turn, directly impacts the overlying asphalt layer. The quantity and depth of stone installed, determined by surrounding ground conditions and the use of the area, are key components ensuring a solid "bed." 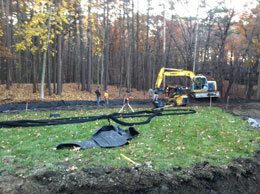 Proper compaction of the stone sub-base is another factor in ensuring a sound foundation. This is attained by installing the material in lifts with individual compaction of each layer. 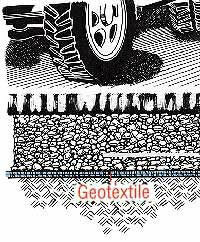 Placed between the sub-grade and sub-base, the geotextile functions as a rugged separation of sub-grade material from the gravel sub-base. In turn, stabilization of the foundation is achieved. In addition to improper sub-base preparation, water accumulation beneath pavements is also a deteriorating element for traffic bearing surfaces. Areas in need of asphalt resurfacing have suffered the effects of fatigue as a result of continual expansion and contraction of the asphalt, aging over time, rut formation, and cracking caused by extreme temperature changes. These deteriorating processes allow for the penetration of water beneath the asphalt overlay and can reduce the life of the asphalt by half. 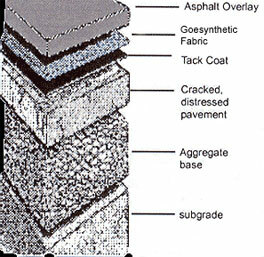 Once the existing pavement has been cleaned of all debris, all voids and potholes leveled, the non-woven geosynthetic fabric is secured and is followed by the asphalt overlay course. This interlay system works to create a full moisture barrier, insulating the overlay from the effects of the underlying, distressed asphalt pavement. Prevents contamination of the subbase and base layers by fines. 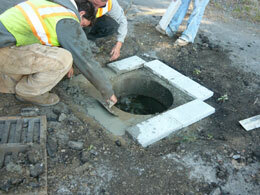 Allows use of more structurally efficient free-draining open-graded base materials. 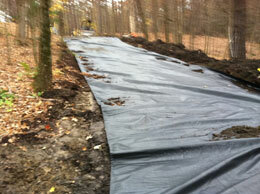 Reduces the depth of excavation required to remove unsuitable subgrade materials. Saves inclement-weather downtime, because work can continue under most conditions. Reduces costly maintenance repair and upkeep. 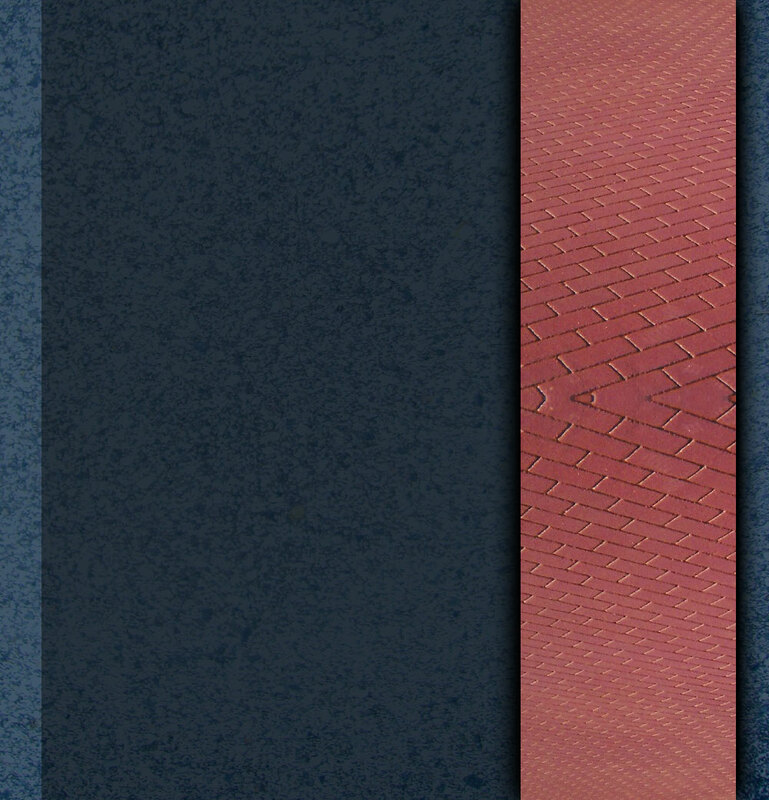 Incorporating geotextiles into the overall pavement design represents one solution amongst a vast array of drainage systems available. 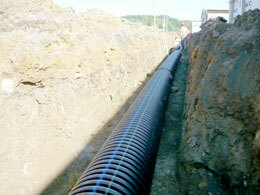 The most effective drainage system will depend upon the surrounding terrain and the utility of the area. Harbour Roads has extensive experience working with various alternative systems and welcomes the opportunity to consult with you and provide a recommended specification.